Hi readers.Lets see all information about Boat race festival in Kerala. Vallam Kali is a traditional boat race in Kerala, India. Kerala is a land of backwaters and beaches. A number of water sports are associated with the major lakes in Kerala. Vallam Kali is one of the major water sports in Kerala is boat racing, which is being organized by a number of social and religious organizations. 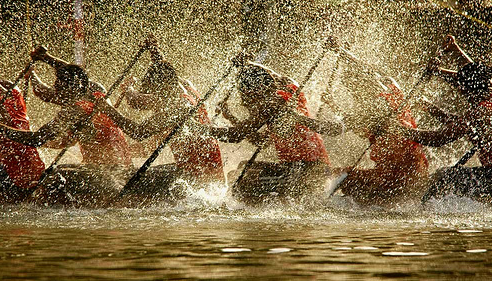 It is a form of canoe racing, and uses paddled war canoes. It is mainly conducted during the season of the harvest festival Onam in autumn. Vallam Kali includes races of many kinds of paddled longboats, the traditional boats of Kerala. snake boats get their name from their shape rather than anything to do with live snakes! A snake boat (or chundan vallam) is actually a long traditional canoe style boat used by the people of the Kuttanadu region, in south India’s state of Kerala. It’s a traditional war boat of Kerala. Typical snake boats are 100 to 120 feet long, and hold around 100 rowers. Each of the villages in the region has its own snake boat, which they take great pride in. Every year the villagers get together and race the boats along the lakes and rivers. 2.0.0.1 wonderful lovely Malayalam Wishes in Messages for Whatsapp and Facebook with Images……. 2.0.0.2 Click once to see Onam Greeting Cards Wishes and images…..
5.0.0.1 Click here to see Onam text messages SMS and wonderful lovely wishes…..
7.0.0.1 Click here to see wonderful lovely Kerala Dances & Songs with Lyrics…..
Four main snake boat races & 15 minor ones are held each year, in and around Alleppey. The spectacular Nehru Trophy is held on Alleppey’s Punnamda Lake. The race of Chundan Vallam (snake boat) is the major event. Hence Vallam Kali is also known as the Snake Boat Race and is a major tourist attraction. Other types of boats which do participate in various events in the race are Churulan Vallam, Iruttukuthy Vallam, Odi Vallam, Veppu Vallam, Vadakkanody Vallam and Kochu Vallam. The Nehru Trophy Boat Race is a popular Vallam Kali event held in the Punnamada Lake near Alappuzha, Kerala, India. There is also an interesting legend behind this very electrifying event. The story goes that once about 10 kilometers up the river Pamba from Aranmulla, the head of the Katoor Mana, a Nambudiri family, offered his daily prayers and was waiting to feed a poor man to complete the ritual. After waiting for long, Brahmin closed his eyes and started praying to Lord Krishna. As soon as he opened his eyes, he saw a ragged boy standing before him. The Brahmin lovingly gave a bath to the boy, a new set of clothes and also a sumptuous meal. To the utter surprise of the Brahmin, the boy vanished after having the meal. He searched for the boy and spotted him at the Aranmulla Temple but the boy disappeared again. Namboodari concluded that it was no ordinary boy, but God himself. To commemorate the event, he began to bring food to the Aranmulla temple every year during the time of Onam. And, to protect the food from the river pirates, Kovilans or snake boats used to accompany the entourage. wonderful lovely Malayalam Wishes in Messages for Whatsapp and Facebook with Images……. As the tradition gained popularity, the number of snake boats increased leading to the custom of a grand carnival called Snake Boat Race. Vallamkali boat are no ordinary boats and there are fixed measurements to it. It is about 100 feet long and has a seating capacity of 150 men. The boats are usually made of anjili (Artocarpus hirsuta), though sometimes teak and kadamb (Naucleacadamba) wood is also used. The curled ends of the boats are shaped like cobra hoods and it is from this shape that boat has derived its name. Each boat is meticulously crafted by skilled craftsmen and a lot of patience and hard work goes into making and decorating it. The boat is treated as a deity and a holds a lot of emotional value for the village folk. Only men are allowed to touch the boat that too with bare feet. Each boat belong to individual villages located near the river Pamba. Click once to see Onam Greeting Cards Wishes and images…..
Vallamkali Boat RaceVallamkalis are tastefully decorated with green and scarlet silk umbrellas. The number of umbrellas attached to a boat holds significance as it signifies the affluence of the family to which they belong. To render a more maginificient look to the boat gold coins, ornaments and tassels are also added. Great care is also taken for the upkeep of the boat. A carpenter repairs the boat on an annual basis. The boats are lubricated with fish oil, coconut shell and carbon mixed with eggs. This also helps to keep the wood strong and boats slippery in water. This way one can always find a boat ready for a swim. Nehru Trophy Boat Race will be conducted on the second Saturday of August every year is a major tourist attraction. 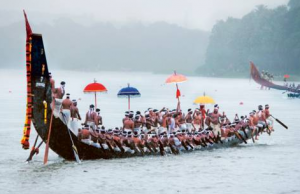 Champakulam Moolam Boat Race is one of the ancient and most popular boat races in Kerala. The race is organized on the river Pampa at Champakulam, Alappuzha. The snake boats are called so because of the huge sterns of these boats that looks like a hood of a cobra raised in anger. The average length of the snake boats measures to hundred feet. The legend has that the Raja of Chempakasseri, Pooradam Thirunal Devanarayanan, built a temple at Ambalappuzha as suggested by the royal astrologers. It was discovered that the idol which was being placed at the temple was not fit. Therefore, a new idol was brought to this place from Karikulam Temple in Kurichi. As this idol was brought to the temple on a boat, the king declared that watersport will be organized on this particular date every year, to commemorate this event. Aranmula Uthrattadi Vallamkali or the Aranmula Boat Race is the oldest known boat race event which takes place in Kerala. The boat race takes place during the festival of Onam, which occurs during the Malayalam month Chingam (August – September). The boat race is dedicated to Lord Krishna and Arjuna. The boats which are used for racing are huge. They have four helmsmen, 100 rowers and 25 singers who sing Vanchipattu songs throughout the race. The traditional snake boats which are especially used here for racing are called ‘Palliyodams’ by the natives. Each boat is decorated with a golden lace. Along with these decorations every boat has a flag and two or three ornamental umbrellas. Click here to see Onam text messages SMS and wonderful lovely wishes…..
Payippad Jalotsavam is one of the finest snake boat races organized all over the world. The boat race is organized in a span of three days on the lake Payippad, which is located 35km from the district of Alappuzha. There is a close relationship between the Payippad Jalotsavam and the Subramanya Swamy Temple situated at Haripad. The legend has that before the actual construction of Sree Ayyappan Temple, the people of Haripad village had a vision that they should install the idol of Subrahmanya which was to be found at the bottom of the Kayamkulam River. Interestingly, the idol was supposed to be placed under a whirlpool. The people found the idol at the exact location. Hence, they brought the idol to its present location on a boat. This festival is celebrated every year in commemoration of that event. A lot of credit for the popularity of the Snake Boat Race can be attributed to the first Prime Minister of the country, Pandit Jawahar Lal Nehru. He was so enchanted by the spirit of the this traditional team event that he decided to promote it in a big way.He instituted a trophy for the event, which came to be called Nehru Trophy Boat Race. The Nehru Trophy Boat Race is a popular Vallam Kali held in the Punnamada Lake near Alappuzha, Kerala, India. Vallam Kali or Vallamkali literally means boat play/game, but can be translated to boat race in English. The most popular event of the race is the competition of Chundan Vallams (snake boats). Hence the race is also known as Snake Boat Race in English. Other types boats which participate in various events of the race are Churulan Vallam, Iruttukuthy Vallam, Odi Vallam, Veppu Vallam (Vaipu Vallam), Vadakkanody Vallam and Kochu Vallam. The annual Nehru Trophy Boat Race takes place on the backwaters of Punnamada in Alappuzha of Kerala. The race is a rowing competition, which takes place between numerous teams who participate in this event to contend for the Nehru Trophy. The history behind the event is that, a snake boat race was conducted when Pt. Jawahar Lal Nehru visited this place. He was so impressed by the enthusiasm of the rowers that he awarded the Nehru Trophy to the winners. Since then the Nehru Trophy bears a silver model of a snake boat and is awarded to the winning team of the boat race. Click here to see wonderful lovely Kerala Dances & Songs with Lyrics…..